When SpaceX launched its Dragon space capsule atop theFalcon 9 rocket today (Dec. 8) ? and retrieved it in the Pacific Ocean a fewhours later ? it was a first on several levels. 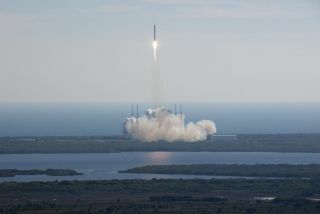 For SpaceX, the launch marked theinaugural voyage of the company's Dragon spacecraft. The mission also marked the first time any private companyhas successfully launchedand returned a commercial spacecraft from low-Earth orbit. Finally, theflight was the first mission under NASA's COTS (Commercial OrbitalTransportation Services) program aimed at spurring private sector developmentof space vehicles to carry crew and cargo to the International Space Station. While rocket launches from the Cape are considered a commonoccurrence, the historic significance of today's achievement by SpaceX shouldnot be lost. This is the first in a new generation of commercial launchsystems that will help provide vital support to the International Space Stationand may one day carry astronauts into orbit. This successful demonstrationflight is an important milestone in meeting the objectives outlined byPresident Obama and Congress, and shows how government and industry canleverage expertise and resources to foster a new and vibrant space economy. These new explorers are to spaceflight what Lindbergh was tocommercial aviation. This is further validation that a commercial venture -initially almost totally privately funded - can achieve a launch and re-entryon a schedule and at a cost much lower than typical NASA developments. I think the SpaceX success shows that it will be possiblefor NASA to buy services in low Earth orbit - thereby saving money for NASA'strue mission - exploring deep space! I was just leaving NASA HQ after a meeting this morning whenthe launch was about 2 minutes away. As I walked through the lobby thecountdown was playing on the NASA TV monitor there so I, along with severalother people, stopped and watched it take off. I heard one of the folks fromthe back exclaim as it cleared the launch tower, "go," and I thinkthat symbolized better than a lot of other comments how many from the breadthof the space community feel about this effort. Its success is, withoutquestion, an important step forward. There are many steps yet to be completed on the path toFalcon 9?s operational use. I am greatly encouraged by and applaud SpaceX?saccomplishment. I?m looking forward to future successes. Most important, I wantto see this effort successfully fill much of the void left by the retirement ofthe Space Shuttle and the sooner that happens the happier I will be. Scott Pace, director of the Space Policy Institute atGeorge Washington University in Washington D.C. Excellent news -- and a very important step in ensuring U.S.ability to provide logistical support to the International Space Station. I don't know this changes the landscape dramatically ? it'sanother step toward achieving lower cost logistical support to low Earth orbit.It does, however, underscore the importance of flight tests. Presentations andpress releases are one thing, actual hardware demonstrations are another, sothe team should be very proud of what they accomplished. Watching the Falcon 9 rise brought a surge of excitement.Beautiful liftoff! NASA may get the cargo capability it's counting on to fillthe gap left by the retiring shuttle. Flying Dragon atop the Falcon 9 is afundamental step toward meeting SpaceX's cargo commitment to NASA, and inmoving eventually toward safe and economical astronaut transport. SpaceX deserves a lot of credit for duplicating theirinitial success and orbiting and retrieving the Dragon spacecraft. It was anambitious flight that looked very good. NASA may make spaceflight look easysometimes, but this was a tough flight plan to execute for a new commercialfirm. SpaceX's equipment appears to have met a big technical challenge, andwe'll have to look for similar business success to provide NASA with cheaperoptions for space cargo and astronaut transport. This is an historic milestone in the paradigm shift from agovernment space infrastructure to a private space business that will createjobs, opportunity and benefits from technology advancement. Space is difficult,but no more so than other high tech parts of our economy. It was a thrillingday. This flight will go down in history as a turning point forthe opening of space to regular people. It may not be Yuri Gagarin, but it iscertainly the equivalent of Sputnik for commercial spaceflight! Falcon 9 nailed it. We congratulate Elon Musk and his teamon a successful launch -- another step towards commercial applications that mayone day help NASA carry supplies and astronauts to low-Earth orbit. Boldendeavors like this will advance the chances for success for everyone in theEarth-orbit business.